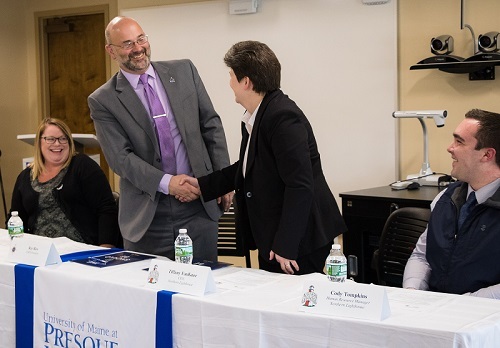 In an effort to better meet the region’s workforce development needs, officials with the University of Maine at Presque Isle and The Northern Lighthouse Inc. will sign the area’s first local agreement meant to strengthen the collaborative efforts of both organizations in preparing students—or potential future employees—for careers in the workforce. 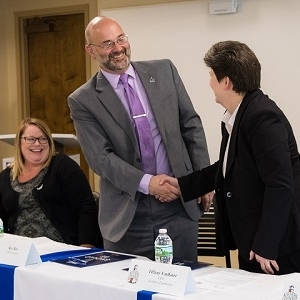 As part of the agreement, UMPI will provide a comprehensive career readiness program that utilizes both classroom and real world experiences in preparing students to be active members of the workforce. UMPI will also market employment opportunities and collaborate with The Northern Lighthouse Inc. to ensure that graduates demonstrate the skills and abilities necessary to be successful in the workplace. In return, The Northern Lighthouse Inc. will work with faculty and staff to provide internships and other short experiential career experiences for students, serve as mentors or sponsors to students, assist with career readiness activities on and off campus, and provide job postings, promotional materials and marketing materials when needed. The University is actively working with other regional employers to put other Campus to Career agreements in place. According to Nicole Fournier, UMPI Director of Career Readiness, the Campus to Career Program will help students to realize the many career opportunities that are available, increase their awareness of job openings in the region, and identify skills for development: “It adds more depth to what we’re doing already with career readiness while strengthening a close working relationship with our area employers,” she said. Austin Daniels is one UMPI student taking advantage of that more in-depth career readiness experience. Daniels is participating in an internship at Northern Lighthouse, and just three weeks into the work experience, the agency is already talking about a permanent position for him. Officials expect that outcomes like this will be a regular feature of the Campus to Career Program. For more information about the Campus to Career Program, please contact Nicole Fournier at (207) 768-9589 or nicole.l.fournier@maine.edu.